For the past decades there have been two different tariff systems in operation in the so called Eastern region of Austria, i.e. the three federal states Vienna, Lower Austria, and Burgenland. As of July 6, 2016, after years of intense preparations, there is only one unified and consistent tariff system. The figures generated during the first two months since its introduction represent high demand. One of the reasons for the successful start might be the just tariff design. Opposed to the former system, prices are now calculated depending on the distance between a point A and a point B based on the most common route between these two points. The price is also related to the boundaries of municipalities and not zones, as it had been the case before. Also, the prices for buses and trains are equal. Additionally, continuous concessions have been introduced, such as a discount for elderly, disabled, and blind people. 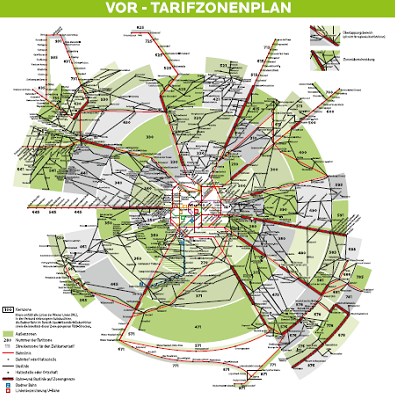 The former zone systems of VVNB and VOR belong to the past because, as of July 6, 2016, there is only one unified and consistent tariff system for public transport in Vienna, Lower Austria, and Burgenland. For past decades there have been two different tariff systems in operation in the so called Eastern region of Austria, i.e. the three federal states Vienna, Lower Austria, and Burgenland, covering around 44% of Austria’s population. It has been four months since the introduction of the new tariff system and figures show that residents of the Eastern region have been well accepting the new offer: applications of annual passes were expected to come to 4,000 in August. However, they eventually amounted to 13,000. The unusual fact: many of them are pre-orders for September and October. The reason for these early pre-orders might be the remarkably fairer fare design in the new tariff system of VOR. Unlike in the former tariff system, prices are calculated for the distance between a point A and a point B based on the most common route between these two points. The price is also related to the boundaries of municipalities and not zones, as it had been the case before. Also, the different prices for buses and trains are in the past in addition to continuous concessions for elderly, disabled and blind people. Especially for these groups of customers it is an immense benefit that public transportation including transfers can be used consistently in the entire region with a reduced ticket. Another criterion for this easier, ample, and fair tariff was the elimination of the exceptions which were often tough to be reasoned, such as longer trips for less money compared to tickets for distances that were shorter but more expensive. The majority of passengers does not notice any price difference. For instance, main relations such as St. Pölten – Vienna including urban public transportation have remained at about EUR 1,590 (annual pass) which the only difference that urban public transportation in St. Pölten is now also included. Passengers can obtain tickets from vending machines of the Austrian Federal Railways ÖBB, the public transport operators Wiener Linien and Wiener Lokalbahnen, in the customer centre „VOR-ServiceCenter“ at the train station Westbahnhof Wien, at ticket counters, from bus drivers in regional busses as well as the online ticket shops of Wiener Linien, ÖBB and VOR. Contact: pr at vor.at or Valérie Kleemann for more information.